Home Client Side Object Model (CSOM) PowerShell SharePoint Online Version History SharePoint Online: How to Enable Versioning on a Document Library using PowerShell? SharePoint Online: How to Enable Versioning on a Document Library using PowerShell? What is versioning in SharePoint Online? Once the versioning feature is enabled, you can view/restore the previous versions of the document. How to Enable Version History in SharePoint Online Document Library? Navigate to your document library >> Click on Settings gear >> and then "Library Settings" Menu item. 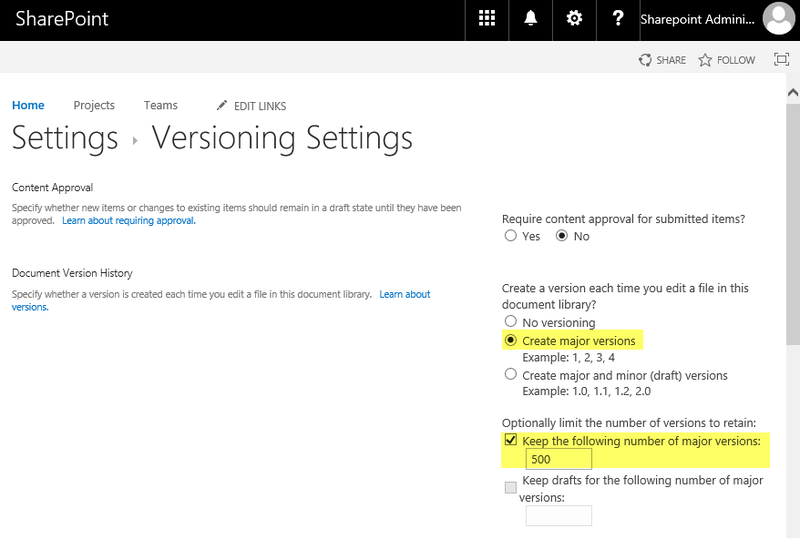 Under Library settings page, Click on "Versioning Settings"
Select "Create major versions" option and enter number of versions to track (by default, this is enabled with 500 versions in SharePoint Online). Scroll to the bottom of the page. Click "OK" to apply versioning setting changes. write-host  -f Green "Version History Enabled for Document Library!" How to Disable Quick Edit in SharePoint? How to Create Alert on List View in SharePoint? How to Change Friendly Date Format in SharePoint?